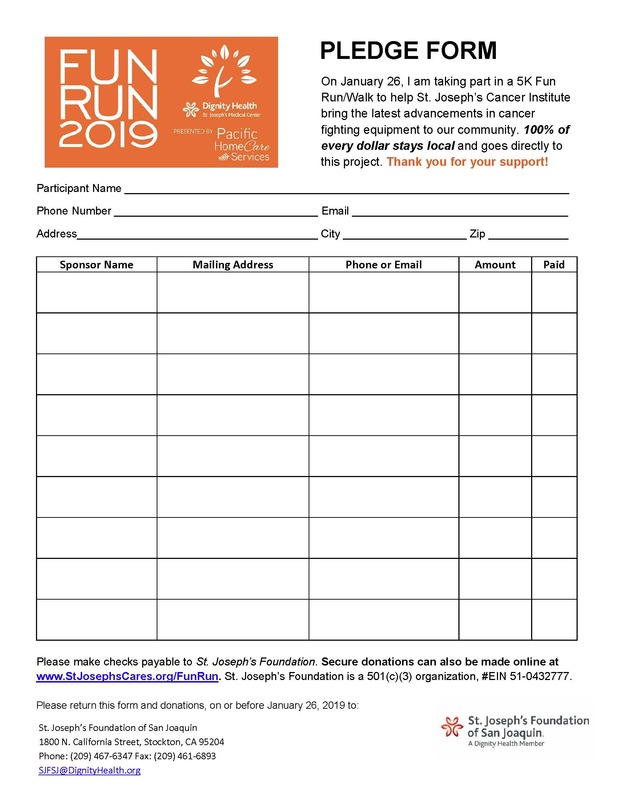 On Saturday, January 26, more than 600 people will lace up for St. Joseph’s 10th Annual Fun Run/Walk for Wellness, presented by Pacific Homecare Services. Together, we hope to raise $60,000 to help St. Joseph's Cancer Institute bring the latest advancements in cancer fighting community to our community. 100% of every dollar stays local and goes directly to support this project. You can help us reach the finish line by signing up to walk or run, or by making a donation by mail or online below. If you would like to make a donation in honor of a Fun Run participant, please enter the participant's name in the comment box below. Please contact us if you have any questions, (209) 467-6347 or SJFSJ@DignityHealth.org. Thank you for your support! We will only reach our goal with your help! Download a pledge form and invite your family, friends, and co-workers to make a tax-deductible donation in support of your 5K participation. Making a gift to support our Fun Run goal is easy and convenient! (Plus, you can earn special activity points in the Wellable Fun Run 10 Year Anniversary Challenge.) Simply select one of the methods below. To give a one-time employee contribution using your credit card, please use the secure donation form to the right. To give either a one-time gift or an ongoing recurring gift using payroll or PTO deduction you may go directly to the Dignity Health Employee Self Serve (ESS) site.